THE CULMINATION of a year-long research project, Ritual Reconstructed, saw rabbis, artists, film-makers and playwrights participate in an interactive bricolage “happening” of ritual objects, photographs, poetry, drama, storytelling and rabbinic dialogue. Taking place at JW3, the event explored faith rituals which combine both Jewish and LGBTQI (lesbian, gay, bisexual, transgender, queer/questioning & intersex) identities. The afternoon kicked off with a walkthrough photographic exhibition by Mary Humphrey – who came to the project as a “curious Catholic”. Her colourful and evocative photographs show people, ritual objects, and lifecycle events through a queer Jewish lens. Another highlight saw Tom Ross Williams performing a scene from emerging playwright’s Run, about a rebellious 17 year old gay Jewish Orthodox boy in love. 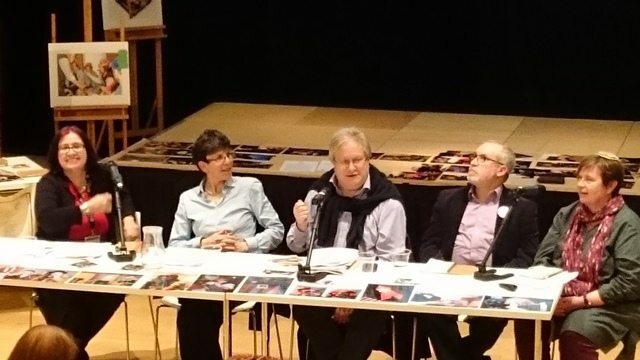 The event’s grand finale was the world premiere screening of the Ritual Reconstructed mini documentary series on Jewish LGBTQI rituals in the UK. Ritual Reconstructed is funded by the Arts and Humanities Research Council through the Connected Communities stream and consists of a collaborative partnership between Buckinghamshire New University, the University of Portsmouth, the Centre for Trust, Peace and Social Relations at Coventry University and Liberal Judaism.